Apple Watch users will soon be able to tap their device on NFC-enabled gym equipment to sync workout details such as calories burned, speed and distance with the machine for more accurate tracking. The function will be available “this fall” with some of the “largest gym manufacturers in the world” who currently provide 80% of the gym equipment across the US. The feature will be made available on watchOS 4, Apple’s Kevin Lynch told attendees at the Apple Worldwide Developers Conference (WWDC) taking place in California this week, where it was also announced that Apple will be adding support for NFC tags to iPhone 7 and 7 Plus devices through the iOS 11 operating system. “When we use gym equipment, it has data that the Apple Watch doesn’t have and the Watch has data the gym equipment doesn’t have so you end up with numbers — like calories and distance — that don’t completely match,” Lynch said during the opening keynote. “So on watchOS 4, we have come up with a great solution for this. “We’re enabling — for the first time — two-way data exchange in real-time with gym equipment. 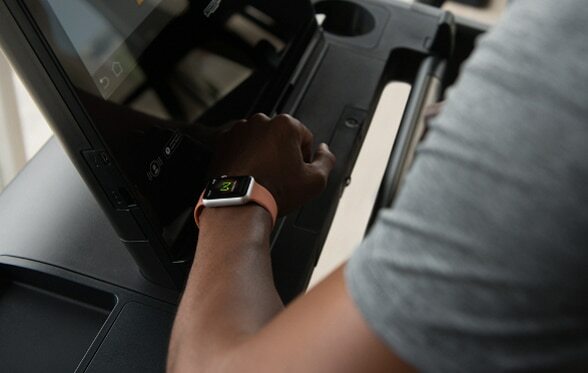 So, you’ll be able to simply tap your Apple Watch on an NFC reader on the gym equipment. Supporting gym manufacturers include Life Fitness, Cybex, Matrix, Techno Gym, Schwinn, Star Trac and StairMaster.